Have you ever wondered How to Run Android Apps On Windows? If Yes, then this Article is for you as in this Article, I'm going to Share Top 3 Android Emulators For Windows. 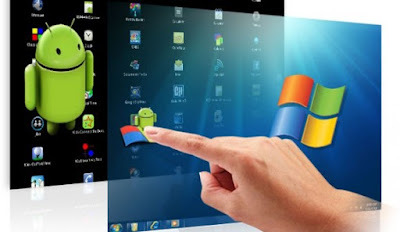 Using Android Emulators, you can easily Run Android Apps & Games on your Windows PC. You can Play Games at High FPS. There are many Android Emulators on the Internet but here I've shared Top 3 out of them. On these Emulators, you can install hundreds of Apps & Games. Apart from Android Emulators for Windows, there are many other Emulators like Linux Emulators, iOS Emulators and many more. Bluestacks, one of the oldest, trusted and most popular Android Emulators For Windows. With this Emulator, you can easily run most of the Apps on your Windows PC. You can do Multitasking, launch Multiple Games at a time, Install Tons Of Apps and do much more using this Android Emulator. Bluestack is one of the favorite Android Emulator as it gives update time to time. Though it is somewhat laggy, you will have a great experience using it. Andy, another Emulator which is one of the Best Android Emulator using which you can run most of the Apps & Games on your Windows PC. This Emulator is based on VirtualBox due to which it doesn't require any dedicated graphic to run smoothly. It works much better even on Intel HD Graphics. The Emulator is much better than any other Android Emulators as you can Customize everything you want. Moreover, you can Run Tons of Apps & Games that too without lag. If you are looking for an Emulator for Multitasking, Playing Multiple Games at a time, then this Emulator will be perfect for you. Nox App Player is one of the Best Android Emulator For Windows which uses Android 4.4 KitKat. In this Emulator, you can install many Apps & Games to Play. Apart from this, you can easily Root this Emulator with Just One Click. It has an inbuilt feature through which you can easily Root Nox Emulator in One Click. This was the Article On Top 3 Android Emulators For Windows PC. Hope you liked this Article and it helps you in finding Best Android Emulator. Apart from this, there are many other Android Emulators available on the Internet but here I've shared the list of 3 Best Android Emulators.